I’m afraid I haven’t really had much time to post this till now, but two days ago I set off on another research trip–this one, less about records, and more about the actual places and era in which the lives of the people I’m researching played out. On Sunday, August 31, it was a sunny (and, in my AC-lacking car, rather hot) afternoon when I headed out for the town of Kulpmont. It’s just a few miles east of here and more than slightly connected with my research: according to the history books, the earliest settlement was begun there about 1875, but it wasn’t much to speak of until thirty years later when Monroe H. Kulp began the first major development of the town. Hence, the community was named after him. But, I had a specific destination in mind in the borough of Kulpmont. This destination was a place I’d been to before, but only long enough to walk about outside, and I’d never had a chance to see as much of the building as I’d hoped. This time, however, I had contacted the owner and he (knowing the general history of his property already) had agreed to let me come by and get to know more of what the building was actually like. The church has been empty for many years, though it was still used occasionally at the time the Centennial book was written. Two days ago, I, as a dedicated student of the prominent Kulp family’s history, was able to enter the old church for the first time. Accompanied by the courteous and helpful owner (who, by the way, has marvelously restored the next door rectory, he let me explore there too), I entered by the second door toward the rear, which you can see in the photo at the top of a short, straight flight of steps. This led to a vestibule with doors of lovely old woodwork, and the entrance to the nave was at the left. 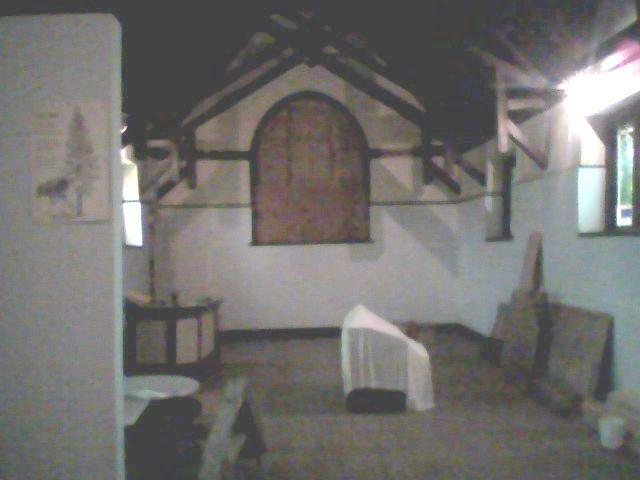 From the raised level where once was situated the altar, I looked out over a wide, open room roofed by a vaulted ceiling with the old, dark woodwork still intact. The pews no longer stood in this old gathering place of faith, and both main windows had been removed due to damage, but the smaller stained glass windows along the sides remained. Toward main window; the main entrance is just at the left of the window. Most of these photos were lightened since I was using my cell phone camera, which produces a darker, higher contrast image. One of the side windows, at the right as you’re looking toward the main window as shown in previous photos. 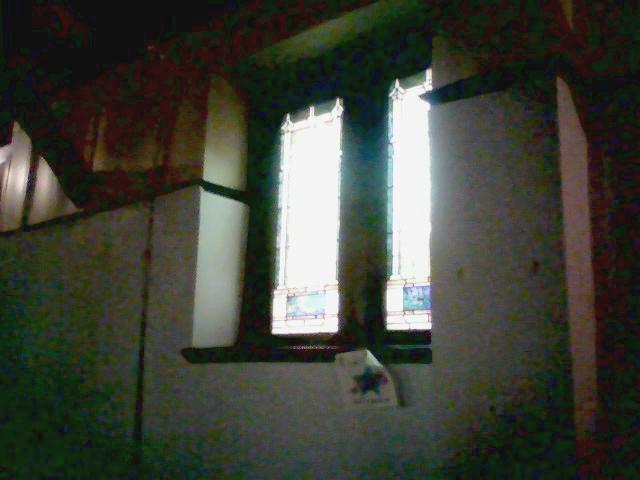 Another window at the right; I left this image as-is to preserve the stained glass detail of the window. 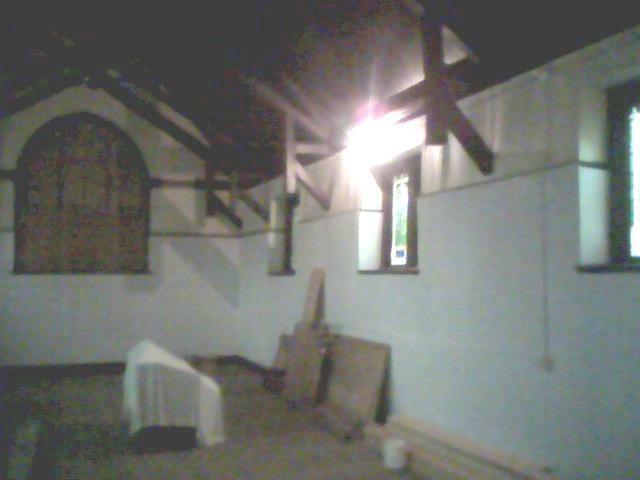 If you look closely, you can see the outline of where the second main window was here at the back of the church, above what used to be the location of the altar. Outside again, I walked about the exterior of the church, taking photos along the way, and peered for a moment into the basement. 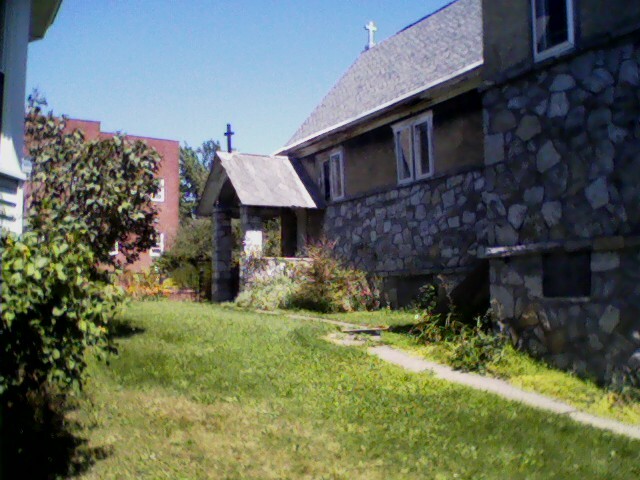 Looking toward the main entrance from the back porch of the rectory. 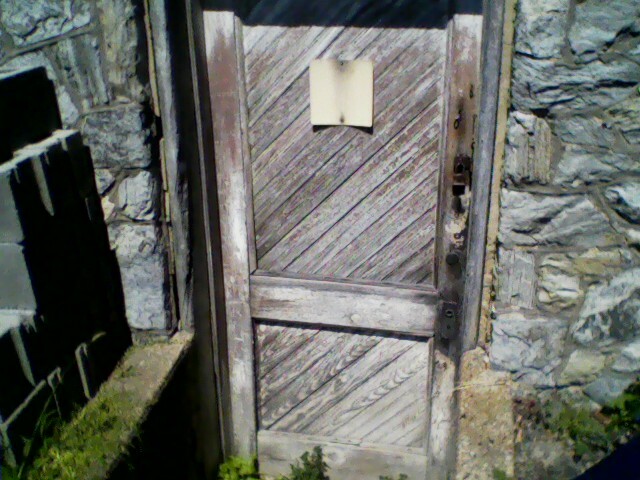 The door to the basement. 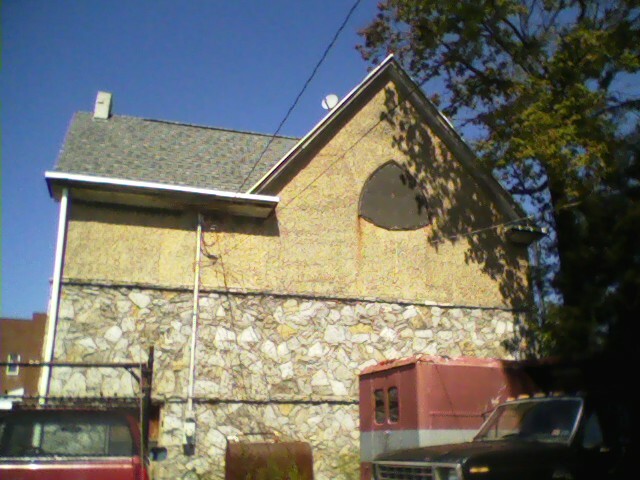 Note the stone walls of the church; very well-built. I took this photo as I was leaving; note the location of the back window as shown in previous photos. 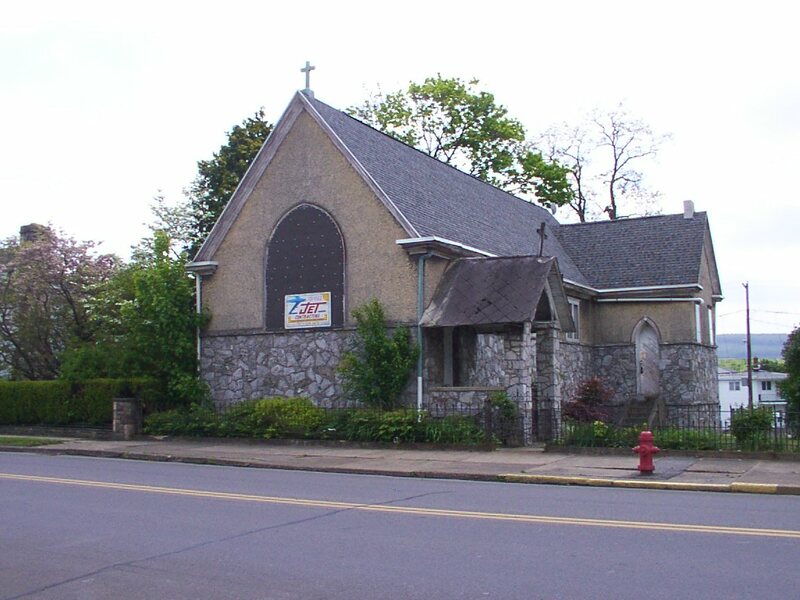 So, this then was the Church of the Ascension, the same attended by Sarah Kulp for so many of the later years of her life. I have been to very few places, actual buildings that is, where I know for certain that the people of my research have also been (most of those places are no longer standing). 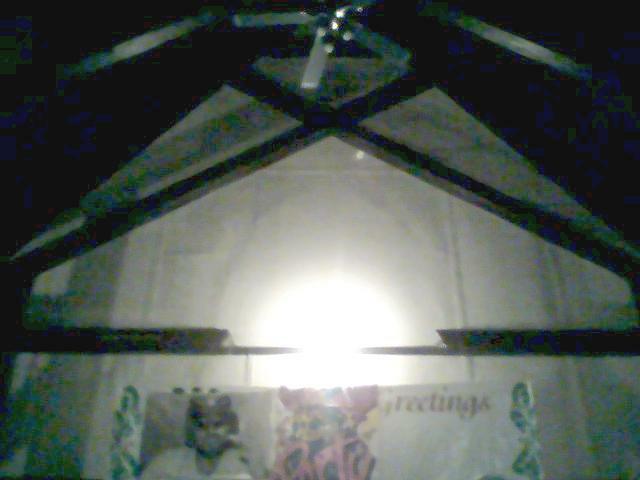 So it was another significant step in my research to have finally had a glimpse inside this church on August 31, even though I have not been hard at the material (records) aspect of research lately. It was a wonderful trip I could never have turned down! Now…onward! Plans for Harrisburg are in the works, though not likely to happen quite soon. I am also going through the census records lately–and think I may have (finally!) found George Washington McConnell in the 1850 census. Needless to say, nowhere near Halifax where he should have been! 🙂 But, it’s not verified. Will post soon about it. I am also a Kulp from Forty Fort,PA near Wilkes Barre,PA. I am also intersted in the Kulp family history. I am not sure what exactly you are looking for specifically, but while in the Hoyt library in Kingston, PA a few years ago, I happen to come across this book in the reference dept: The Kulp Family by George Brubaker Kulp from abour 1865(not sure of exact year). Actually, only one chapter was about the Kulp’s. It caught my eye because my Dad’s name was George Harrison Kulp. The chapter is a who-married-whom and who-gave-birth-to-whom. Several were Mennonite ministers and George Brubaker was a lawyer and politician. Hope you find this info helpful. Thank you, Linda, for your comment! I think I have heard of that book, but I’m not sure if I’ve ever had a chance to read it. I’ll look into it. Though, I don’t believe I know of any connection between the Kulps I’m researching and George Brubaker Kulp; actually the only George Kulp I can think of off-hand was a son of Clarence C. Kulp, Delaware County. I’ve been trying to find out more about that branch lately. Anyway, thanks again for the tip! I appreciate it! 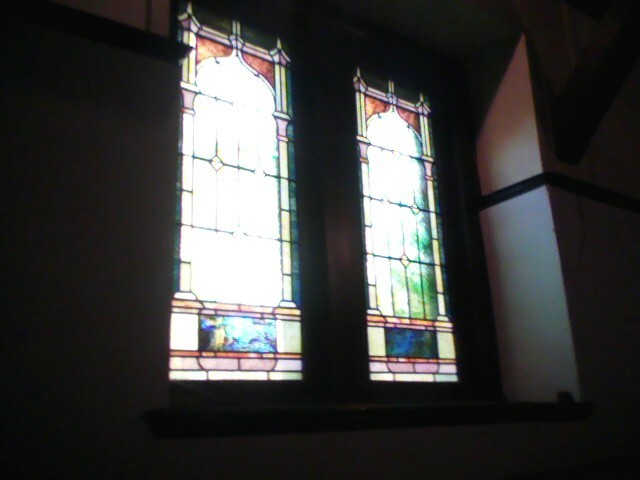 My grandfather , Frank Ramsey Allison was a minister at this church in 1920 , when he died from appendicitis His wife Bertha Crawford Allison, and young adult children Paul , 22, and Mary 17, lived there , too. My cousin , Jean Marsh Adams ,90, and I, Jean Allison Snider ,71, came through town looking for the church. I am so glad you put these photos on line so we could see where our parents worshipped. It has been hard to find out information because church records are from the diocese , not the library or historical society. I did talk to a man , William, today, at the local Episcopal mission , who knew a few facts.